Heat recovery is a well established practice in a number of sectors of the process industries; it has become standard practice to consider heat recovery options at the early design stages for various processes. However recent experience in the application of Process Integration techniques to a number of industrial processes by the Industrial Systems optimization group at CanmetEnergy and others (see chart below), demonstrates that there remains a very significant potential to improve energy efficiency via heat recovery projects (seehttp://goo.gl/YCKhN ). Process integration (sometimes narrowly defined as “pinch analysis”) is a systematic approach for analyzing and understanding energy flows throughout an industrial process as a whole, rather than focusing on the efficiency of individual equipment. The correct application of these tools and methods can be used to improve energy efficiency and reduce energy costs as well as to reduce greenhouse gas emissions and water consumption. In a recent presentation by the Office of Energy Efficiency (NRCan) it was announced that a series of workshops will be conducted throughout Canada to promote the use of these methods in industry; the CanmetEnergy group has also developed a software tool to assist process engineers in the evaluation of the most promising heat recovery opportunities. A financial incentive is also available from the Government of Canada to facilitate the execution of process integration studies; funding provided by Natural Resources Canada can cover up to 50% of a process integration study cost, up to a maximum of $50,000. A Process Integration workshop is already planned for the upcoming Energy 2011 Conference, taking place in Mississauga, Ontario November 29-30. The “Maximize Heat Recovery and Your Bottom Line with Process Integration” workshop will describe how more than 50 Canadian manufacturing plants have achieved significant energy and cost savings by implementing the recommended projects from a Process Integration study. Available tools and services will also be presented, including incentives, training, case studies and software. 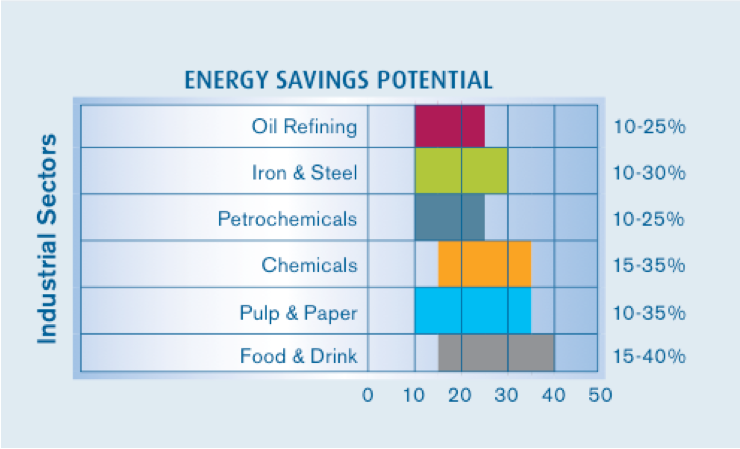 It is important to note that although there are a number of well-known heat recovery opportunities (e.g. power generation from waste heat), the challenge remains for engineering groups to identify the best project (or combination of projects) that will result in optimal energy efficiency, particularly for cases where alternative projects are mutually exclusive. Process Integration studies should be updated to evaluate whether the economics have changed and rejected projects may become attractive under updated economic scenarios. As discussed in a report by McKinsey (“Energy Efficiency; A compelling global resource”, 2010) energy efficiency represents approximately 40% of the greenhouse gas reduction potential that can be achieved economically. In fact a large number of projects pay for themselves in reasonable timeframes and continue resulting in lower operating costs. Energy efficiency measures are the most attractive option available to industry today to reduce emissions and increase competitiveness; with the incentives and the rationale it is expected that more and more companies will realize the benefits of improved heat recovery. Process Ecology has the experience and resources to assist you in the application of Process Integration to your facilities, if you want to learn more about how you can benefit from these studies please contact us.